The 68th Canne Film Festival has just come to an end in May. We have enjoyed a splendid visual feast, at the same time never forget the selected stunning films like the Palme d'Or DHEEPAN and Palme d'Or short film WAVES'98. But do you know the DVD and Beta media are no more accepted for short film competition of Cannes? Participants need to take measures to convert DVD to MP4, MOV, FLV, AVI etc for uploading. The best DVD copy software can help you solve this problem perfectly with no quality loss and fast speed. In view of the fact that there are plenty of DVD backup programs in the market, many people are lost in the problem of making a choice. Here I will introduce you what the most significant factors to be considered while selecting the best DVD ripper for Mac/PC. Easy-to-use and intuitive user interface for both novice and experts. Decryption technology is required when it comes to copyright DVD. Available both to home-made and commercial DVD disc. Among the factors above for the best DVD copy software, here I list top three DVD ripper software for a reference of your choice. According to massive DVD ripping apps reviews, the best three DVD copy software below cover down the best solutions of how to copy a DVD on Mac/Win. As one of the best DVD rippers, MacX DVD Ripper Pro behaves proficient not only in copying DVD but also ripping DVD to MP4, MOV, FLV etc. In addition, decryption is as easy as pie for MacX because it works well in removing DVD CSS, region code, RCE, Sony ArccOS, UOPs, Disney, etc. Not to mention the fast speed of DVD copy, it's known as the fastest DVD backup software for Mac since there is a test that MacX DVD Ripper Pro copied the DVD Six Sense to iPad formats in just over 12 minutes on a Mac mini with the latest 2.5GHz Intel Core i5 Processor, 8 GB Memory and macOS Mojave. The editor of the Top Ten Reviews has appraised that MacX is a terrific DVD copy software and it works fast while maintaining a high level of quality with a board range of supported devices. 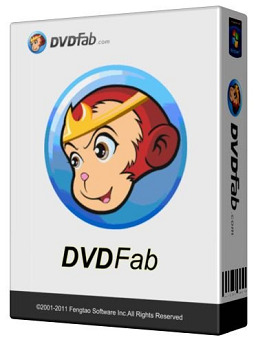 DVDFab is popular worldwide, and known for its power and flexibility. Different from MacX DVD Ripper Pro, the copying and ripping function of this DVD decoder is separated into DVDFab DVD Copy and DVDFab DVD Ripper. Common users may feel it inconvenient for installing two software to finish copying and ripping steps, but for demanding users it's perfect to rip or backup DVD with professional DVD software. 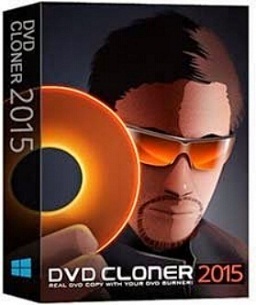 DVD Cloner is a powerful application that earns the Top Ten Reviews Gold Award for DVD copy software. It supports 1:1 clone DVD without having hassle with the technical details of burn and allows you to create a single anthology Blu-ray disc out of several different DVD movies. Less than half an hour is enough for copying a full-time DVD. All in all, DVD Cloner is a simple, powerful and feature rich DVD backup software. It is deserved to rank the best DVD software of Top Ten Reviews. In order to make you feel more intuitive about the main function of the best DVD ripper for Mac software above, I will show you the contrast of them in aspects of easy-to-use, copy speed and decryption. Relatively, MacX DVD ripper Pro is rising and potential to be the best DVD ripper - its advanced GPU Intel/Nvidia/AMD HW acceleration and High Quality Engine make it the fastest and highest quality DVD copy software. Good news is that it supports to rip any type of DVDs, including copying damaged DVDs, Japanese DVDs, 99-title DVDs, unplayable DVDs in VLC/QT, new DVD movies, and many more that can't be handled by other DVD converters. But some are still unfamiliar with the steps of how to copy DVD to hard drive or computer. Never mind! Here I will show you the simplest way of DVD copy with DVD copier for Mac/Win. 1Add DVD. Free download the best DVD copy software and launch it. Insert your desired DVD to hard drive of your PC and click "DVD" to import the disc. New DVD releases can be copied too. 2Choose the output formats. Click "DVD Backup" icon to determine your target format. You can choose to backup DVD originally with multiple tracks and subtitles or backup a single one. 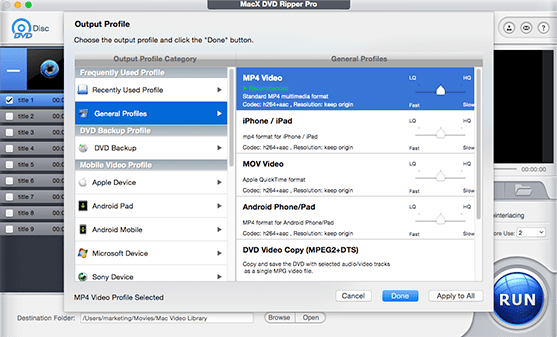 Alternatively, online formats like MP4, MOV, AVI, FLV etc are also available for MacX DVD Ripper Pro only if you choose other profiles such as "Apple Device", "General Profiles" and so on. 3Specify output file path. Click "Browse" button to choose the destination of DVD to be copied. 4Start DVD copy. Click "RUN" button to start the fast DVD copy process. For later DVD watching on iPhone iPad etc. you can rely on MacX MediaTrans to sync the video file to mobile devices in a speed much faster than iTunes delivers. As ordinary beings, if you just want to copy DVD to DVD folder or ISO for collection or copy DVD to computer, iPhone, iPad in MP4, MOV, AVI etc, MacX DVD Ripper Pro is enough for you because it could not only be able to 1:1 copy DVD to ISO for future DVD burning but also rip DVD to MP4, MOV, AVI, etc for playback on iPhone Xs/X/8/7/SE/6S/6S Plus, iPad Air 2, iPad mini 4, iPad Pro, Sony Xperia Z5, Samsung Galaxy S9 edge+/Note 9, etc. This is a DVD cloner for Mac review, comparing the features, pros and cons of best DVD cloner for Mac on cloning DVD or copying DVD for backup on macOS.